Although healthcare seems to have been improved, nowadays’ society isn’t really much healthier than before. One of the main reasons is given by low-quality foods. When it comes to raising our children, we want the best for them and that includes feeding them properly with safe and natural foods. For that purpose, I have created this article, in order for you to find out more regarding organic baby formulas and things you should consider to pick the best option you can afford. Many moms love this product because it is free from many potentially-harmful and controversial ingredients. According to many people, this organic formula is safe for your little one and it doesn’t seem to lead to allergies. It’s rich in whey protein which makes the product easily digestible. In other words, your baby won’t experience an upset stomach after being fed. As pure as this product is, it still contains certain soy ingredients but these won’t harm your infant as long as he or she isn’t allergic to these compounds. It appears that Baby’s Only organic formula promotes softer stools in babies. Toddlers can also be fed with it. It contains some soy-based elements. One can of Baby’s Only Organic Formulacosts $14.99 (it measures 12.7 ounces). On Amazon, you’ll find the toddler version which is $88.90 (a pack of 5 containers). This organic baby formula is USDA-certified. Simply put, the milk included in the blend is sourced from cows that weren’t exposed to hormones, pesticides, and antibiotics. Vermont Organics is a product that’s fortified with both minerals and vitamins and the mix is pretty similar to the one found in breast milk. All in all, it’s a balanced baby formula. This product remains safe for most babies, despite the fact that it contains soy and palm oil which might not be the healthiest options. Also, some moms try to steer clear of formulas that contain DHA and ARA but these two ingredients help the baby’s development. According to some consumers, the powder might not dissolve very easily so you need to shake the bottle thoroughly. If your infant gets constipated, you should stop using the formula immediately. Comes with a prebiotic which helps the infant’s digestive system. It’s sweetened with corn syrup. You can purchase Vermont Organics Infant Formula for the price of $71.80 (a pack of 2 containers, each measuring 23.2 ounces). The company has recently revised their products’ ingredient lists because, in the past, they tended to focus too much on corn syrup. The blend comes with the proper amount of carbs and has a nice sweet taste due to lactose. This product is free from GMO ingredients and it’s a kosher powder. Earth’s Baby formula is easy to digest and it comes with Omega-3 and Omega-6 fatty acids. Read Also: Earth’s Best Sensitive Formula Review: Will You Love It? Although it contains DHA, it’s good to know that’s water extracted. The formula is approved by the FDA and USDA-certified. The milk is provided by cows which are fed exclusively with grass and grains. It’s fortified with iron but this gives the blend a funny taste and smell that seems a bit metallic. Some babies might experience constipation after consuming this formula. This is a non-GMO and USDA-certified. The standard variety blend contains DHA. On Amazon, one container of Earth’s Best infant formula has the price of $23.27 (a can of 23.2 ounces). Luckily, the company has launched multiple varieties of the same product to target several niches and meet different needs: non-DHA, toddler formula, sensitivity, gentle, etc. This formula is a pretty impressive and balanced choice. It doesn’t contain DHA and it’s free from corn syrup. All these characteristics make it one of the healthiest and safest alternatives on the market. The company does its best to provide high-quality products and its baby formula is enriched with iron to support brain development. This organic powder helps your little one’s immune system and it’s easy to digest. The product, however, may lead to constipation, especially if it’s the first time your baby tries it. The milk protein is sourced from cows that are exclusively grass-fed. Contains two questionable ingredients: soy-based compounds and palm oil. You can purchase a 21-ounce container of organic premium baby formula by The Honest Companyfor the price of $28.78. Plum Organics’ formula works great as safe nourishment for both newborns and toddlers. Instead of adding all sorts of shady sweeteners, the company wisely decided to only include lactose. The container comes in handy, being highly convenient and easy to use. This powder is a blend that mimics breast milk and it’s also kosher. Read Also: Plum Organics Formula Review (2019 UPDATE): Is This A Viable Option? As you can see, there are certain controversial elements added to the blend. Still, the milk comes from organic farms while the DHA content is said to support a child’s eye and brain development. Most ingredients are pretty safe for babies with sensitive stomachs. On iHerb.com, one 21-ounce container of Plum Organics formula is sold for the price of $35.89. Searching for a safe baby formula means you should also avoid bad stuff. Below, I’ve put together a list of some formula ingredients and additives that are said to create negative effects. The word “organic” written on a formula’s package isn’t enough to make the product completely safe for your baby. Most standard blends contain traces of pesticides, oils extracted with hexane, GMO ingredients, contaminated milk that presents traces of growth hormones or antibiotics, etc. Organic formulas are, most of the times, superior and safer than any conventional alternatives. This compound should only be included in those specific formulas that target infants who suffer from allergies or dairy intolerance. The soy in non-organic powders is usually genetically modified. Europe has banned this element from organic foods. So, make sure to pick an organic baby formula that’s free from soy. This way, you will also avoid aluminum contamination. These two long-chain fatty acids are found in breast milk. However, many formula manufacturers add them in the blends and the thing that should worry you is their extraction method. For instance, if they are extracted using hexane they have a greater risk of being harmful. To prevent any kind of potential issue, you should stay away from formulas that contain these two elements. Breastmilk is rich in palmitic acid and that’s why producers add palm oil to formulas. However, vegetable oils, including palm oil, have a different type of molecular structure. In other words, the fat content of these elements is digested differently. Moreover, palm oil is said to inhibit calcium absorption while breast milk’s fat molecules lower gas and colic, promote the existence of healthy gut bacteria, and reduce constipation. Some formulas contain synthetic preservatives which are included in the mix to keep oils from getting spoiled. Even a number of organic formulas feature two of these preservatives on their ingredient list: ascorbic palmitate and beta carotene. Breast milk is very sweet. Therefore, many formulas, if not all of them, contain a certain amount of added sugar. Lactose resembles the natural sweetness of breast milk the best but this compound isn’t cheap. As a result, a lot of companies use replacements such as plant-based sucrose which was banned in the European Union due to concerns of obesity. Other sweeteners that one can easily find in baby formulas are corn syrup, brown rice syrup, maltodextrin, etc. Taurine – the processing method of taurine uses carcinogenic sulfuric acid. Unfortunately, the health food departments of many stores are full of products that contain this particular additive. It’s derived from seaweed and it is meant to stabilize liquid formula. Still, several studies have shown that carrageenan might lead to health problems like intestinal inflammation and even colon tumors. Casein protein – just like cheese curds, these proteins form solids in one’s stomach while also exiting the digestive system at a slower pace. Unlike whey protein, casein has higher risks of allergies and digestive issues. The optimal ratio between these two ingredients may vary based on several factors like the age of your child and the baby’s unique needs (digestive reflux, health problems, etc.). Probiotics are healthy bacteria while prebiotics sustain the life of probiotics. A healthy immunity is sustained by good gut bacteria. Breast milk comes with powerful prebiotic properties so, to mimic this natural nutrient profile, plenty of manufacturers add a mix of probiotics and prebiotics to their formulas. Although there are doubts about whether or not these ingredients provide real benefits, they aren’t harmful either. Prepare the formula using mineral water that’s rich in silicon which is believed to lower the aluminum absorption. Luckily, the FDA has finally banned BPA from being included in the container linings of baby powder formulas. So, you can stop worrying about it. On the other hand, I am wondering about the thing that replaced BPA. Nevertheless, this, in my opinion, represents a small yet important victory for moms and their kids. Higher lutein content which helps the baby’s eyesight. By feeding your baby with organic formula, you will keep him or her safe and healthy while also helping the planet. The decision to buy organic powder supports the efforts that producers make to raise cows naturally. Also, the organic food industry is safe from genetically-engineered processing methods. Organic formulas are free from pesticides and GMOs (genetically-modified elements). Organic formulas have added nutrients like choline, arachidonic acid, and fatty acids. All these elements are naturally found in breast milk so they are beneficial for your little one’s health. Organic formulas are safer to consume due to the fact that they don’t contain pesticide residues. These harmful substances can lead to lung damage, immune dysfunction, and many other serious problems. When it comes to feeding your infant, I must say that I am pro-breastfeeding. 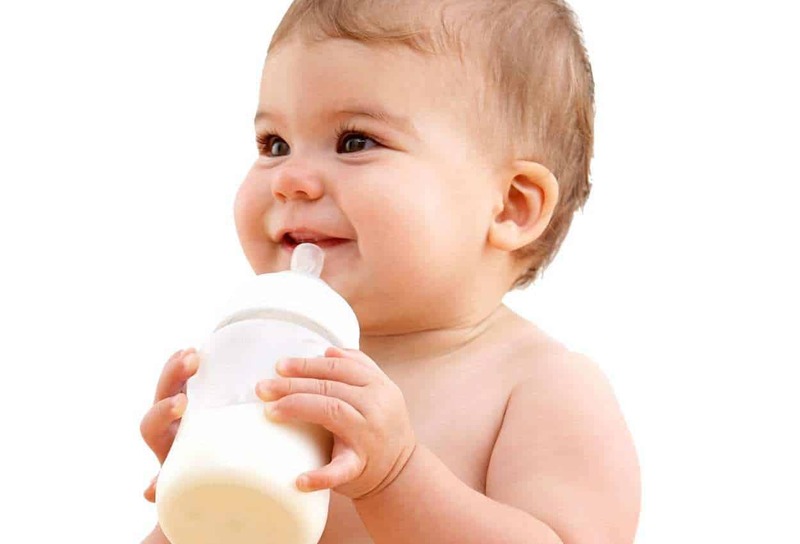 Specialists say that a mother should feed her baby with breast milk for a minimum of 6 months but, according to several studies, nourishing your toddler until he or she reaches the age of 2 years old would be even better. That is, of course, a matter of personal preference and every single situation is unique, based on the mother’s milk production and the infant’s needs and potential allergies. Allergies that occur at a young age can take a long time to be cured or kept under control, so try to choose a more natural formula. Think whether or not the package that the formula comes in presents any kind of health risk. It’s true, however, that this specific aspect is not as problematic as a few years ago when the linings of powder cans contained BPA. This element is currently banned all across the United States. Still, you should pay attention to it and make sure that the manufacturer respects and follows all these safety guidelines. As we all know, plastic bottles can harm our health and well-being. Fortunately, you now have the possibility to opt for BPA-free plastic bottles. So, make sure to use the proper type of bottle at all times. For safety reasons, it’s best to prepare the formula with filtered water. Even if tap water may be totally safe, sometimes, when mixed with a certain formula, might lead to several health risks. So, have you found the ideal organic formula that will suit your baby’s needs, yet? Don’t forget that investing in your child’s health and development is money well spent. The way infants grow and their health represent two major aspects that will create the stage for their ongoing development while also establishing their life’s quality level. The Ultimate Wellements Probiotic Gripe Water Review: Does it Work?